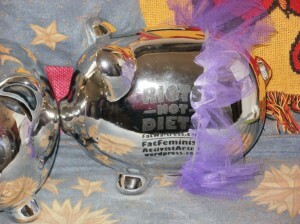 NotBlueAtAll » Blog Archive » Two Piggies & A Pug! Two Piggies & A Pug! Yep, that’s my little Puggyman, checkin’ out the the piggies I just received from Amanda of FatWaitress & LoveYourBodyDetroit! One is for moi! The other I get to decorate and send back to her for some serious fat activism for Love Your Body Day! Yay! So adorable and fun! Purple tu-tu? Yes, please! I don’t yet know how I will be decorating my pig, but I’m excited for the challenge and opportunity to do so! I will of course take plenty o’ pictures when it’s completed to share here with you lovelies! Any suggestions on decorating it? You can never go wrong with florescent paint with glowing the dark accents. Oh and about a crap tone of glitter, sequins and some feathers just to round it out. It works for all them folks on etsy.. Just saying. @Raven: Hmm…yes on the glitter, not sure about feathers. It’s a big porcelain piggy with silver coating. My first idea is to use paint/glitter to section up the pig like they do for cuts of meat, but inside the “sections” would be body positive words. Still figuring it out, but open to more ideas! I still says feathers are the way to go, consider a peacock feather mohawk. @Raven: I like the mohawk idea! Thanks! His picture is hilarious. So cute. @Jery: Ha-ha! I took so many, but it’s like he knows! Ugh! 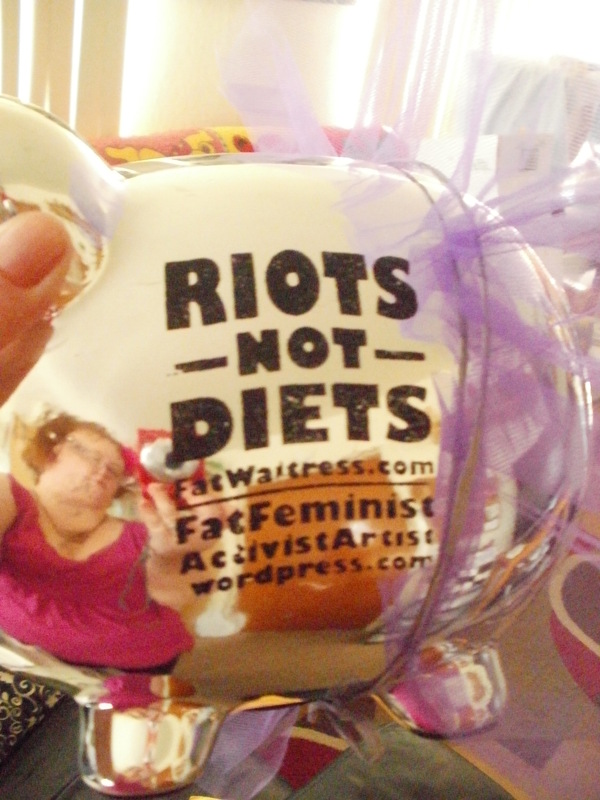 @E. Ai B.: Are you a member of the LiveJournal Fatshionista Community? If not, join and then post about any fellow Texans who’d like to meet up or do a swap! It can be very informal or huge, up to you. But that, I think, is the best place to start. It’s where I got my fat activist training wheels. Thank you for the info, I’m not a member but I need to go over and check that out!